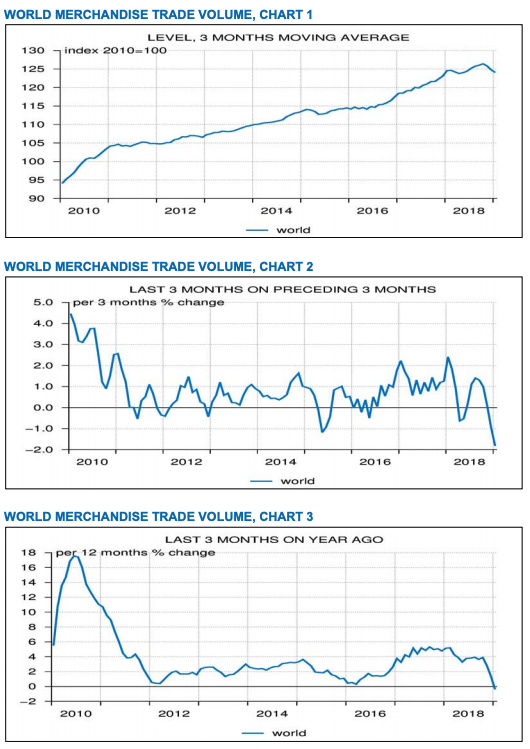 According to the Netherlands Bureau for Economic Policy Analysis (CPB), world trade plunged to its weakest levels not seen since the financial crisis. The report published last week shows world trade expanded by 2.3% in January after the index tumbled in 4Q18. The recent rebound was broad-based with the strongest seen in emerging markets Asia (+6.2%), which followed a decline of -6.5% in December. The three-month global trade momentum shows a downward trend of -1.8%, indicating economic growth across the world continues to slide into 2Q. Bloomberg said, "that's the biggest drop since May 2009." On a y/y basis, global trade posted its first decline in nearly nine years in the three months.
" For example, eurozone manufacturing PMI weakened to 47.6 in March according to Markit, marking the second consecutive month this year that manufacturing activity and export orders declined in the eurozone. The indices for January and February indicate contracting manufacturing activity in most of the east-Asian economies as well," said ING. Transitioning into the 2Q, significant downside dangers are developing. Trade negotiations between Washington and Beijing have been a no deal trade situation at every meeting. With a no deal expected at the upcoming meeting this week, trade talks could go into several more rounds before an agreement is hammered out. If a no deal scenario plays out in 2Q, a further escalation in tariffs or just the lack of removing the duties could spark another growth fear and a repricing event of financial assets, similar to late last year. Another concern is the standoff between President Donald Trump and Europe on auto tariffs. If Washington and Brussels cannot come to a resolution in the next several months, U.S. tariffs on European automobile imports would crush global trade further. Uncertainties around NAFTA countries remain, Canada and Mexico are still unsure if they are exempt from these tariffs.